Two years ago, while helping one of his medical students at Oakland University William Beaumont (OUWB) School of Medicine (Rochester, Michigan) in his research on the local Hispanic community, Dr. Claudio Cortes discovered the Hispanic and Newcomer Outreach (HNO) ministry at Catholic Charities of Southeast Michigan’s office in Pontiac, Michigan. 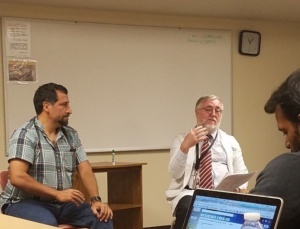 During his visit to the HNO facility, the director asked Dr. Cortes if he would be interested in becoming a mentor for the children served there. His answer was an enthusiastic yes. The assistant professor of Immunology in the OUWB Department of Foundational Medical Studies, Dr. Cortes teaches medical students during their first and second year in their program. “I am passionate about teaching kids – it’s one of my dreams,” he said. Aware that OUWB (through COMPASS, the official name for community engagement at OUWB) is always looking for ways for its students to serve their local community, he considered how he might involve his medical students. And a mentoring partnership between OUWB and HNO was born. The mentoring program between HNO and the medical school is designed to provide educational activities so student mentors and the young people they mentor learn together. “The mentors are role models for the children, and the children teach our students,” said Dr. Cortes. Mentors meet with their charges formally twice a month at the HNO facility, and have contact by phone once a week. 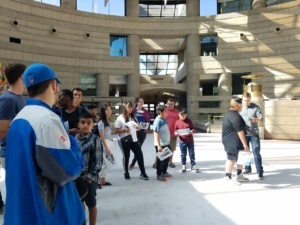 The children participate in monthly educational activities and field trips. In addition to being inspired by their mentors, the children benefit from learning about topics such as wellness, dental health, the benefits of exercise and healthy diet, and the dangers of drug abuse and cigarette smoking. Having overseen the fledgling mentoring program since its pilot year in 2016-2017, Dr. Cortes said this year’s program is better organized, offering an opportunity for leadership for the mentors. “The medical students themselves are coordinating the program with Catholic Charities,” he said. He points out the importance of quantitatively evaluating the program’s success. He said HNO performed a study and found a positive effect and improvement for the participants (*See results of their abstract below). They found such positive results that their project was accepted to be among several groups who presented their findings at a 2018 conference in April at Miami Dade College in Florida, sponsored by the Latino Medical Student Association (LMSA). The results of the evaluation of the mentoring program were presented on April, 2018 at the 13th LMSA Conference at Miami Dade College, Florida. 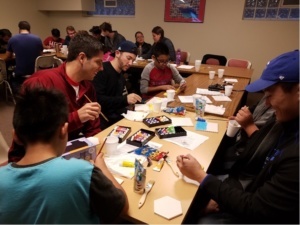 This mentoring program was formed in partnership between Oakland University William Beaumont (OUWB) School of Medicine students and Catholic Charities of Southeast Michigan (CCSEM) Hispanic and Newcomer Outreach (HNO) in Pontiac, MI. Partnering with the community to leverage expertise and enhance learning for both the community and medical students is essential to improving population health. 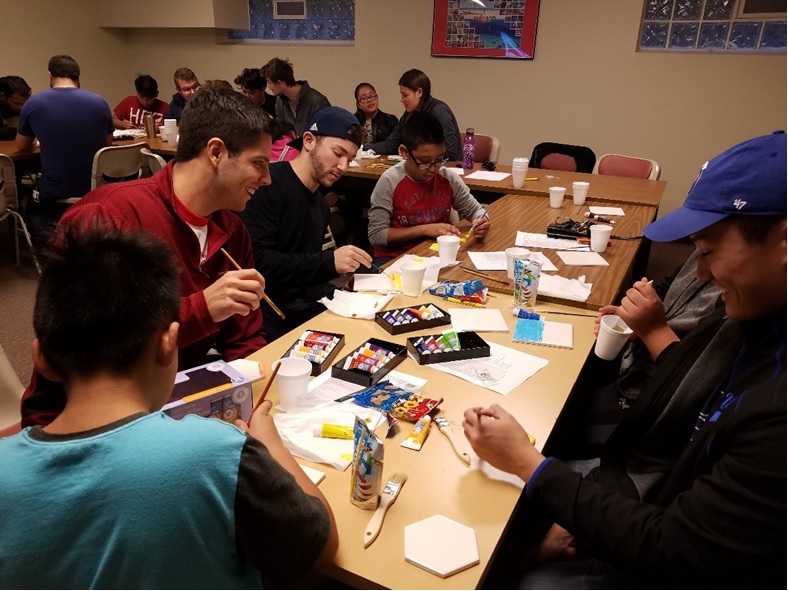 Here we describe the process of how a mentoring program, where medical students mentor Hispanic youth, was established between OUWB and the Latino community through Catholic Charities of Southeast Michigan’s Hispanic and Newcomer Outreach services. We will also describe how this program was incorporated under the LMSA chapter of OUWB, moved toward a faculty and student-driven initiative, and the initial evaluation of the program. The program was evaluated through survey data from the parents, youth, and medical student mentors. The evaluation consisted of formative assessments to determine effectiveness of learning through health educational activities. Portions of the Behavioral and Emotional Rating Scale (BERS-2) for youth were also used to measure participants’ behavioral and social skills. Surveys of medical students included questions related to program satisfaction, perception of communication skills with children, understanding of the needs of children, and mentoring skills. 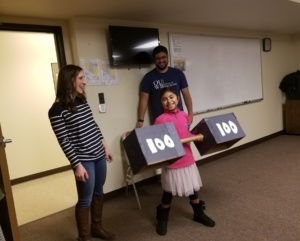 Over the last two years, 50 medical students voluntarily become mentors for 50 children (ages 9 to 16) for a period of six to 12 months at the HNO facility in Pontiac, Michigan. This faculty-supervised program included a training session for mentors, health-related educational activities, field trips, weekly phone calls, and direct interaction with mentees twice a month, which collectively added up to over 2,000 service hours. Results of survey satisfaction show high levels of student satisfaction of the program, increased communication skills with children, especially Hispanic children, and increased understanding of the needs of children. Most of the mentors involved would recommend the program to other medical students. The parents reported their children improved in interpersonal skills, family involvement, intrapersonal strength, school functioning, and affective (emotional) strength. Finally, children’s scores on pre/post-tests increased significantly in 6 out of 8 sessions, suggesting they improved their knowledge, and that most sessions were effective. Creating a productive partnership requires building on the unique strengths and resources within the community. Through the partnership between OUWB LMSA and HNO, the student mentors benefited from HNO’s strength in working with community members. Additionally, the OUWB medical students served as vital resources to positively influence the children involved. Both mentors and the children they mentored benefited in their interactions with each other, including improvements in confidence, communication skills, and cultural humility.